U.S. Sens. Charles Schumer (D-N.Y.) and Kirsten Gillibrand (D-N.Y.) announced $33.7 million in federal funding for engineering assistance to implement positive train control (PTC) on a rail line between Poughkeepsie and Schenectady. Owned by CSX and leased by the New York State Department of Transportation (NYSDOT), the line is used primarily by Amtrak. The route is a federally designated high-speed rail corridor where trains can travel at speeds up to 110 mph, according to a press release issued by Schumer's office. The project will help bridge a gap in PTC coverage between one of the busiest commuter corridors in the nation and one of the busiest freight corridors, Schumer wrote in a letter when he requested the funds from the Federal Railroad Administration (FRA) last year. "With this system, NYSDOT will improve the safety and security of passengers not only on the rails, but in surrounding communities as well, and ensure that this critical transportation corridor remains safe and efficient for years to come," Schumer wrote. Meanwhile, New Jersey Transit has been awarded a $10 million federal grant to install a PTC system, U.S. Rep. Leonard Lance (R-N.J.) announced earlier this week. The funds came from the FRA's Positive Train Control Grant Program, which will provide $197 million to help railroads install PTC systems. Congress authorized the funds in the Fixing America's Surface Transportation (FAST) Act, which was passed in late 2015. 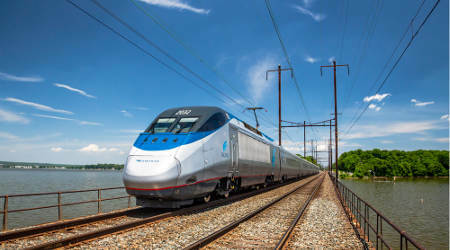 "These funds, coupled with the $330 million already committed to the Northeast Corridor, are needed to improve the mass transit needs of the Garden State," said Lance in a press release. © © TradePress Media Group, Inc.